Palembang is a small two-province monarchy situated near the southern tip of Sumatra in the East Indies. They follow the Shafi'i school of Sunni Islam and are eligible to form Malaya. As country with a Malay culture Palembang can form Malaya. Unify all Malayan provinces in the region under one strong ruler. has a culture of the Malay culture group. must have at least 12 cities. owns Banten (624), Pakuan (2687), Demak (629) and Kalapa (630). Aceh, Batak, Riau, Minangkabau and Lampung. 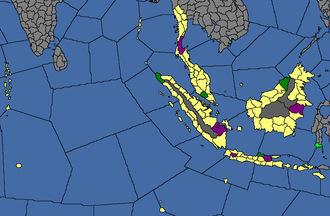 Kutai, Brunei, Kalimantan, Aceh, Riau, Batak, Minangkabau, Lampung, Malaya, and Malacca. 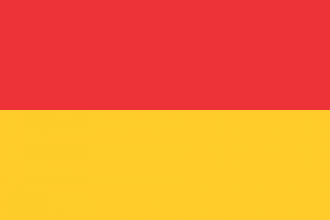 To form Malaya, the player must own all orange provinces and own every province in two of the red, green, or blue region. Forming Malaya grants permanent claims on the shaded area. Palembang uses the generic set of missions with the regional Asian missions. Palembang has fallen far from its time as capital of the great Srivijaya empire. The city has been abandoned by the collapsed Majapahit kingdom and for decades has been plagued by Chinese pirates who use the port as a base for their smuggling operations. When Admiral Zheng He weighed anchor in the city during his expeditions, he drove out the pirates and appointed Shi Jinqing to rule the city. But Zheng He and Shi Jinqing are now dead, and the pirates have to begun to gather once again. Left unchecked they will surely attempt to retake seize the city. The year is before 1446.
enacts Pirate Republic government reform. gets a new ruler with Wu culture. then Palembang gets new missions. They will no longer find refuge in Palembang. Have a good strategy for Palembang? This page was last edited on 25 February 2019, at 09:55.